The most visited art museum in the world, the Musée du Louvre is also an historic monument and one of central Paris’ landmarks. It’s on the Right Bank of the Seine in the 1st arrondissement, right in the heart of Paris and contains nearly 35,000 objects dating from prehistory to the 19th century. The museum covers over 60,000 square meters (more than 650,000 square feet). The Palais du Louvre, which houses the museum, started as a fortress in the 12th century under Philip II, and some parts of the fortress are still visible. When Louis XIV chose to have his court at Versailles, the Louvre was used for displaying the royal art collection. During the French Revolution, the National Assembly declared the Louvre a museum, and it opened to the public in 1793. There are eight main departments in the Musée du Louvre: Prints and Drawings, Paintings, Decorative Arts, Sculpture, Islamic Art, Greek, Etruscan, and Roman Antiquities, Near Eastern Antiquities, and Egyptian Antiquities. “Prints and Drawings” includes works on paper, and the collection originated with 8,600 pieces from the Royal Collection and the collection has grown steadily over the years. Paintings include more than 6,000 works of art that span the 13th through mid-19th centuries. The paintings are overseen by 12 curators. Almost two-thirds are paintings by French artists, with more than 1,200 from Northern Europe. The Mona Lisa is the museum’s most famous painting. The Decorative arts span roughly the same time period as the paintings. The collection includes ceramics, enamels, stained glass, 15th and 16th century gold jewellery, and pietre dure vases. Sculpture consists of works from before 1850 that do not belong with the Greek, Etruscan, and Roman collection. The Islamic Art section is the museum’s newest, with Islamic art from 13 centuries and includes glass, ceramics, wood, textiles, and miniatures. Greek Etruscan, and Roman art includes pieces from the Mediterranean Basin from the Neolithic period through the 6th century, and includes the Venus de Milo. Near Eastern Antiquities include works from Persia, Mesopotamia, and the Levant. Egyptian Antiquities has over 50,000 pieces and includes artifacts dating from 4,000 BCE until the 4th century. To get to the Musée du Louvre, take the Metro to the Palais-Royal-Musée du Louvre stations. Paris Open Tour buses stop in front of the Pyramid, as do several bus lines: 21, 24, 27, 39, 48, 68, 69, 72, 81, and 95. If you are touring Paris by Batobus, the Louvre stop is at Quai Francois Mitterand. 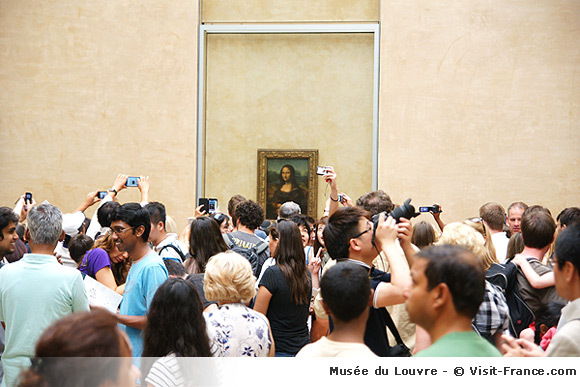 The Musée du Louvre is open every day except Tuesdays, and is also closed December 25, January 1, and May 1. Opening hours are Monday, Thursday, Saturday, and Sunday 9 a.m. to 6 p.m., and Wednesday and Friday 9 a.m. to 10 p.m. The individual rooms start closing 30 minutes before the museum as a whole closes. On the first Sunday of every month and on July 14, admission to the Permanent Collection is free. Full-day access to the Louvre, except for the Hall Napoleon costs €10. Visiting the temporary exhibitions in the Hall Napoleon costs €11. Multimedia Guides in English, Spanish, German, Italian, Japanese, Korean, and French Sign Language can be accessed for €6.